Are you looking for a new salad to add to your dinner routine? 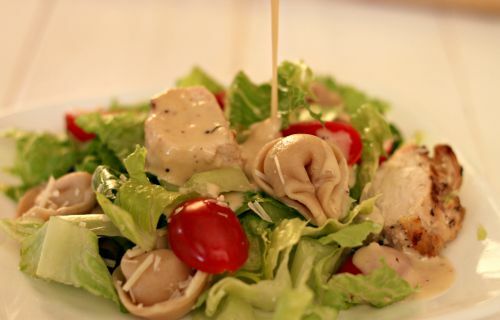 This Chicken Tortellini Caesar Salad is the perfect twist on the classic Caesar Salad that will have both kids and parents asking for more! 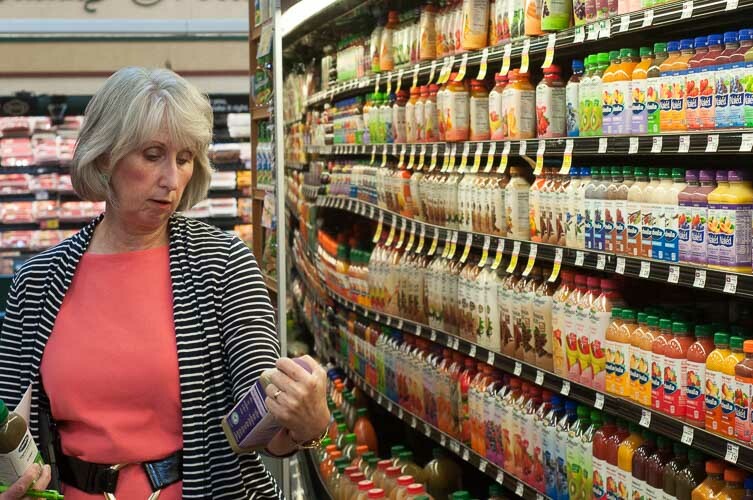 I recently had the opportunity to go on a grocery store tour with a dietitian. I actually enjoy going grocery shopping, well that was before kids. Now my grocery trips involve making a list, packing a toddler and infant into the store, placing the toddler in the seat and the infant seat into the cart; which leaves very little room for any groceries. I try to be there for as little as possible and typically run through the aisles grabbing the same old staples. Once I am in the frozen section I remember my list. I read over the list and realize I have forgotten 10 different items. 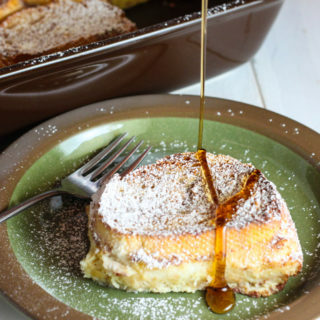 I rationalize with my self and go after the three ingredients we really need and tell myself we will get the rest on the next trip because at about this time the baby starts crying and the toddler is ready for a nap. Sound familiar? One fact that continues to stay with me from the tour is that less than 20% of Americans are getting the daily recommended amount of fruits and veggies. Less than 15%! I like to think we do but I know there are some days that just don’t cut it. 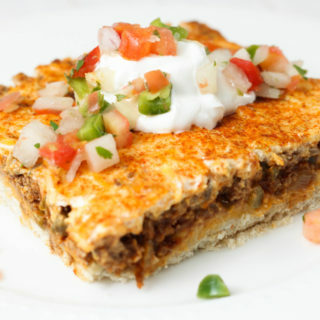 This post is the beginning of a series where I will show you some easy ways to make your meals more nutritious. 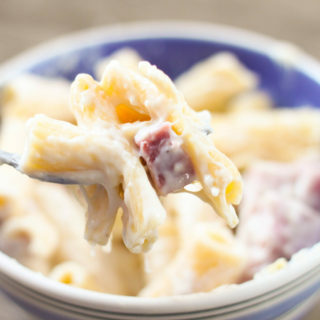 Recipes like this salad feature all of my toddlers favorite things (pasta and cheese) making it a fun way to ensure he is getting his veggies in a way he will actually eat them! For this particular recipe I chose the whole wheat tortellini instead of the regular. A simple switch that helps us add more fiber and whole grains to our diet. 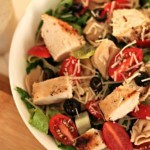 This salad is simple to make and ingredients can be added or substituted based on taste. The recipes starts by putting together a simple marinade. I love grilled chicken but you could easily bake the chicken if grilling isn’t an option. I’m not the biggest dressing fan so at our house I like to serve the dressing on the side. I find you often use less dressing that way! This Chicken Tortellini Caesar Salad is the perfect twist on the classic Caesar Salad that will have both kids and parents asking for more! In a small bowl, make marinade by mixing together the onion, 1/3 cup of dressing, garlic, salt and pepper. Place chicken in a gallon size bag and pour marinade mixture over top. Let sit in refrigerator for 30 minutes to 1 hour. Cook the chicken until no longer pink, let rest for a couple minutes and then slice. 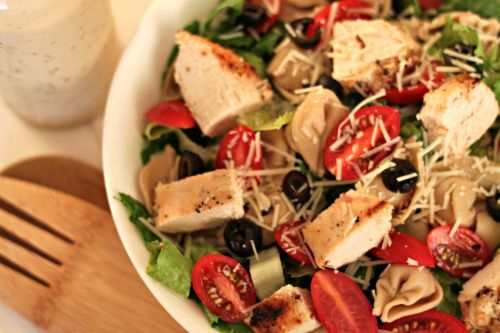 In a large bowl, combine salad mix, tomatoes, olives, tortellini and chicken. Drizzle with the remaining dressing; toss to coat. I was compensated to attend the tour but all thoughts and opinions are my own.